The awful way of life and the hard Byzantine taxes in Macedonia, were a reason for another uprising. The Georgi Vojteh's uprising started in 1072 in the region of Skopje, and was leaded by Georgi Vojteh. The organizers of the uprising asked for an external help from the ruler of Zeta (Duklja), Michailo, who by his father Stefan Voislav was related to the family of Samoil. Michailo listened them with great pleasure and he even sent his son Constantine Bodin to help him so he can be crowned. After crowning in Prizren (Serbia), Bodin changed his name to Petar, in honor of Petar Deljan. Bodin in Prizren arrived, joined by the military leader Petrilo with around 300 people. Soon Constantine Bodin with a part of the army went in the region of Nish (Serbia), Georgi Vojteh stayed in Skopje and Petrilo liberated the cities, Ohrid, Devol and others. But near Kostur (Aegean Macedonia), Georgi Vojteh was defeated by the Byzantium's and went straight back to Zeta. Soon Georgi Vojteh was forced to let Skopje to the Byzantines. But Georgi Vojteh didn't stop to fight against them and on a meeting with Constantine Bodin in Kosovo, the both of them were jailed by the Byzantine army. On the way to Constantinople (Carigrad, Istanbul), Georgi Vojteh has died and Constantin Bodin after arriving in the Byzantine capital, was bought by his father and returned to his fatherland Zeta. After this unsuccessful uprising in 1073, the Byzantine army destroyed and robbed many cities and villages through Macedonia. The attempts made in order of re-establishment of the Macedonian state were stopped for a long period. Also the army of Byzantine destroyed the Samoil's forts and castles in Prespa and the temple St. Achilles was robbed. 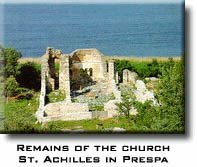 The remains of the temple of Saint Achilles are today in Small Lake Prespa in Aegean Macedonia, in Greece.